Vinca minor, known commonly as vinca vine, myrtle or periwinkle, is a popular ground cover and trailing perennial plant. Grown for its pretty blue blooms and glossy, deep green leaves, periwinkle provides long-lasting texture and color in partially shaded areas. A hard-working plant, periwinkle can also cover difficult to plant sloped areas, ugly wall facades, and bulb beds to cover fading foliage. Care is simple and well worth the effort for such a versatile garden staple. Vinca minor is an herbaceous perennial, sometimes confused with the annual Catharanthus roseus that may also be called periwinkle. Growing to a height of 8 inches and spreading up to 2 feet wide, periwinkle sends out slender vines that produce shiny, 2-inch-long leaves and five-petaled, tubular flowers. Blooms may range from white to blue or purple. 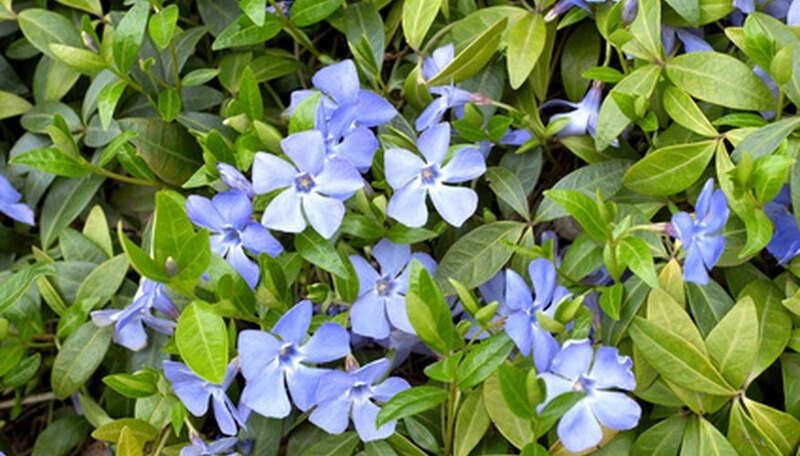 A versatile plant, periwinkle will trail beautifully from window boxes or hanging baskets. As a ground cover, it will provide some structure for a slope or cover a shady treed area where other covers may struggle. Grow it up the sides of barns or outbuildings, or plant them over a bulb bed for contrast and to hide dying bulb foliage. Choose the north side of buildings, or partially shaded areas, for best results. Prepare the soil with 3 inches of organic matter, such as composted pine bark, to a depth of 8 inches prior to planting. If planting in spring, incorporate a 10-10-10 fertilizer at this time at the rate of up to 8 lbs. per 1,000 square feet. Plant starts 12 to 18 inches apart, or closer for a quicker cover. Provide extra moisture, especially when planting under shrubs or trees where periwinkles will compete for water. Provide a light organic mulch, such as composted pine needles, to cover between plants prior to full coverage. Plants may be cut back throughout the season to encourage new growth or control spread. For white blooms, choose cultivars Alba or Jekyll's White. Bowles variety provides a pleasing blue color flower, while Sterling Silver bears deep blue blooms with a white-rimmed leaf. Choose Atropurpurea or Flore Pleno for a single or double purple flower, and Variegata for leaves touched with yellow.